WiFi speed | Really useful stuff that I bump into….. Some users of Windows 10 (any build number) have complained that their WiFi has been going slow – VERY slow. Separately, some people, who haven’t noticed that they have a slow WiFi connection, have complained about other symptoms related to a slow network connection – like poor quality Skype, Lync and Skype for Business calls. I have discovered that the problem is related to Bluetooth being turned on. To cut a very long story of testing with various WiFi and Bluetooth drivers and testing with PC’s with different WiFi and Bluetooth hardware, I have discovered what causes this problem (but I don’t know why – yet). Obviously, I would love to know if this fixes slow WiFi for you – so please leave a comment. After further testing, I have discovered the problem/fix to be much more subtle and while still related to the Location state, it doesn’t actually matter what state it ends up in, as long as the state is toggled. i.e. 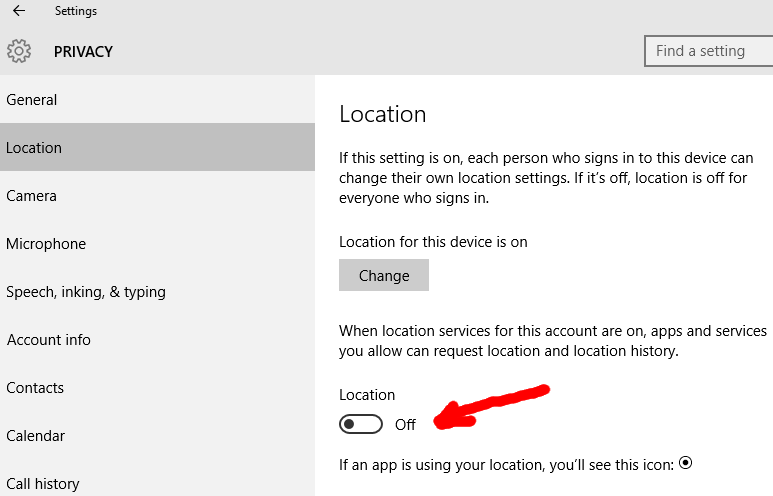 If your have WiFi AND Bluetooth ON AND your WiFi is running slow, simply try changing the Location state to the opposite of what it currently is and then change it back again. For me, on a new install (any W10 build) or rebuild/update, if WiFi and BT is initially ON by default I have SLOW WiFi whatever the state of Location i.e. Location can be initially on or off, it doesn’t matter. What is important, and the fix for me, is that the state of Location just needs to be toggled in order for slow WiFi speed to recover. [This article is original work – over which I own and retain copyright.